Konstantin Alekseevich Korovin was the personification of the artistic bohemia of his time. Possessing an artistic character and bright charisma, the artist was a celebrity and a favorite of all of Moscow. Having a remarkable talent, and having recommendations, he never finished his studies at the Academy of Arts. On the one hand, he was hampered by his keen and careless nature, on the other hand, by the frustration of his teaching methods and his own free and bold writing technique, which stands out against the background. Korovin loved life and enjoyed it, considered the main task of creativity to share the joy and colors of the world in pictures. The main guidelines for its formation were the works of the Impressionists and Post-Impressionists, as well as the Symbolists. Konstantin Alekseevich tried himself in various fields – theater, architecture, applied art, wrote and experimented with genres. The entire painting of the creator is distinguished by the richness and brightness of colors, light and the diversity of happiness. 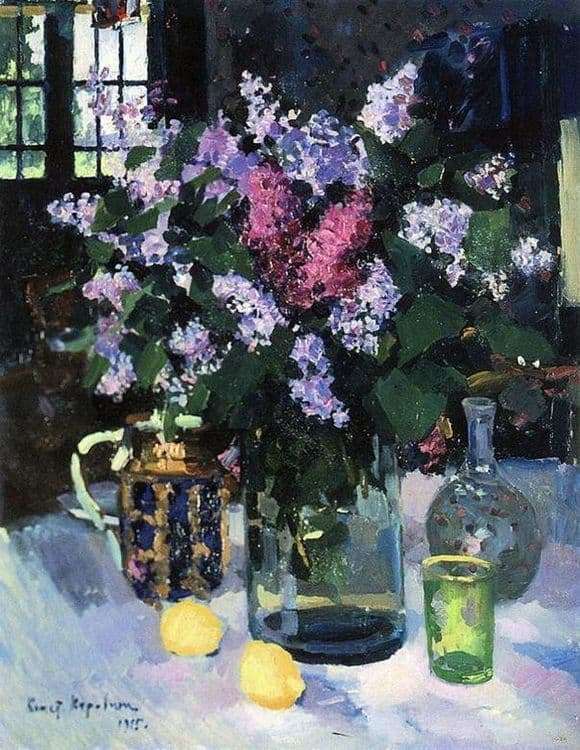 New trends brought Korovin in the genre of still life. Even in the very first works of subjects prescribed them with great care. In 1915, in the heyday of his work, he painted the painting “Lilac”. Without a doubt, this work is executed by the skill of an impressionist artist. Clean light and expressive strokes form a multifaceted inflorescence. Complicated for perception upon close examination, at a distance the bright tones of the bouquet are filled with the light of the June sun. Dancing on the bottle glare and “vibrating” dance of outlines and shapes gives a lively soulless composition. Each item is written out with love, without refined details, but with juicy and expressive strokes. The ease and enthusiasm of the artist’s perception allows you to discover the richness and special charm of the forms and colors in ordinary everyday objects. A special role is given to the color nuances, the play of shades, which all together gives rise to the impression of “movement.” The viewer does not just admire a bouquet of flowers, but feels the fragrance of summer and absorbs the light and warmth of a bright still life.